Didn’t do anything fancy this year. I’m recovering from a csection and taking care of my four year old and my almost four week old. I did manage to get some cleaning done and make real dinner. 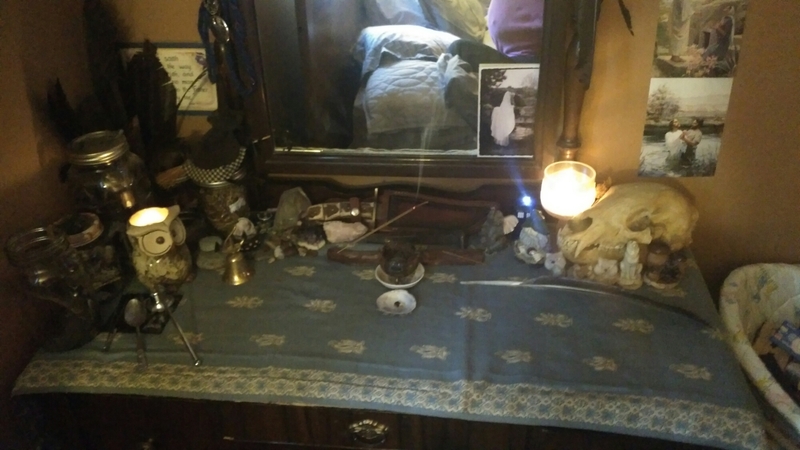 Lit a candle in the small shrine earlier and just put out a saucer of butter, milk, and oats. I am thankful for the darkness and for the returning light. That which is remembered never truly dies. Those who filled our hearts with love. Those we will never know due to the distance of Time and Place. Those whose names we do not know due to treachery and loss. Those who survived and lived with the scars to pass later. Those who did not take a breath, or very few. We hear you and remember you. Two dreams, two days in a row, where the very obvious message is “Trust the Dogs”. The first dream it was literally said. Both dreams also involve “Going into Darkness” or “Confronting Darkness/Fears”. This should be an interesting Hunt Season. Lo do I see my Beloved on this anniversary of her passing. I feel her peace and contentment and know that she is at rest. My heart still aches but it isn’t quite as sharp. May we meet in the Hereafter and say and do all those things we meant to. …the sharp knife of a short life, oh well? So put on your best, boys, and I’ll wear my pearls. As the sun sets, so it begins. 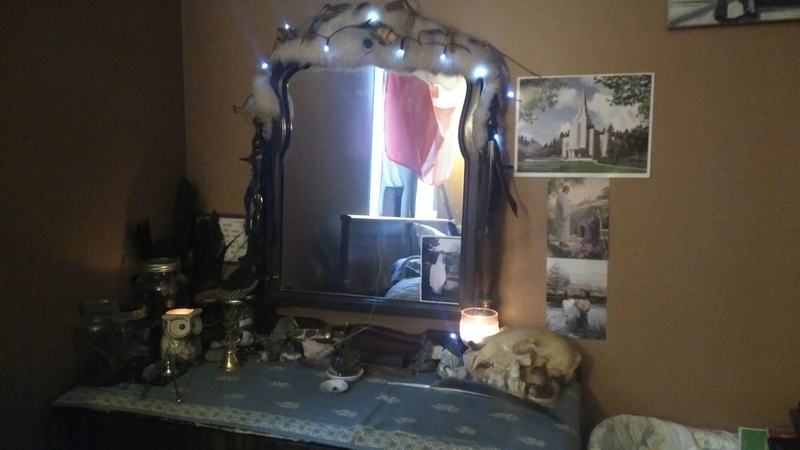 Wishing all who celebrate a most Blessed Beltaine. When I awake tomorrow Hermes will be gone and I will be firmly in Poseidon’s possession. May we remember that where there are endings, there are also beginnings. 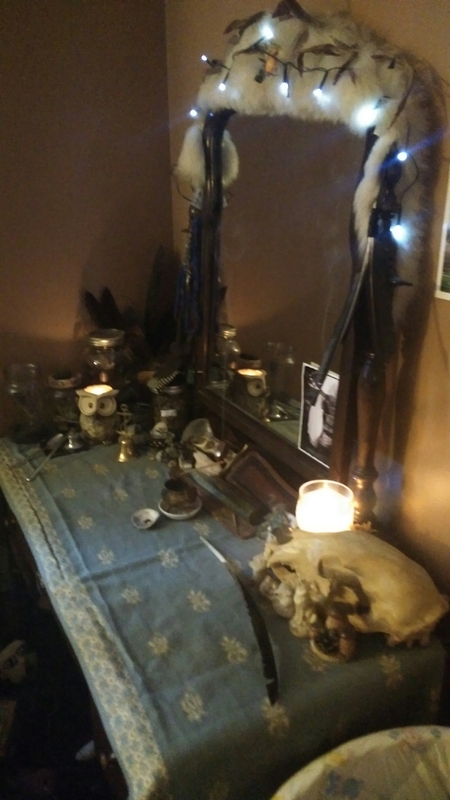 Redid the altar because it was a bit of a disaster. Also other reasons that will be brought up in a later post. Enjoy! This fantastic. I’ve never been a huge fan of April Fool’s Day. This gives me a whole new way to look at the day. I don’t know why it didn’t occur to me that April 4th would be His birthday. My brain is pretty foggy right now. *chuckles*He’s so non-chalant about things. Me: I feel like I’m falling apart. Himself: Well you are…but that’s okay, W/we’re Working on Stuff.